The New Orleans Pelicans have been in the news quite a bit lately, but not for their on-court performance, or lack thereof. During the off-season, they changed their name from Hornets to a more regionally relevant moniker and introduced a frightening mascot that left the kids of Crescent City in tears, even when the Pels managed a win. 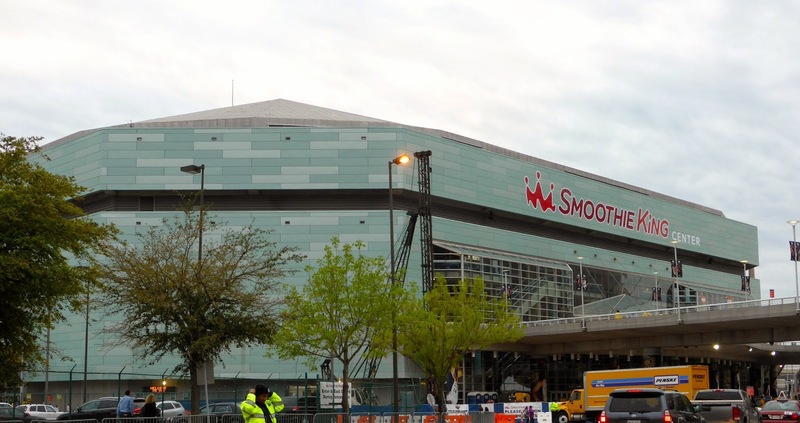 More recently, the aptly named New Orleans Arena joined the crowd of corporately sponsored venues by signing an agreement with Smoothie King, just in time for the NBA All-Star Game last month. 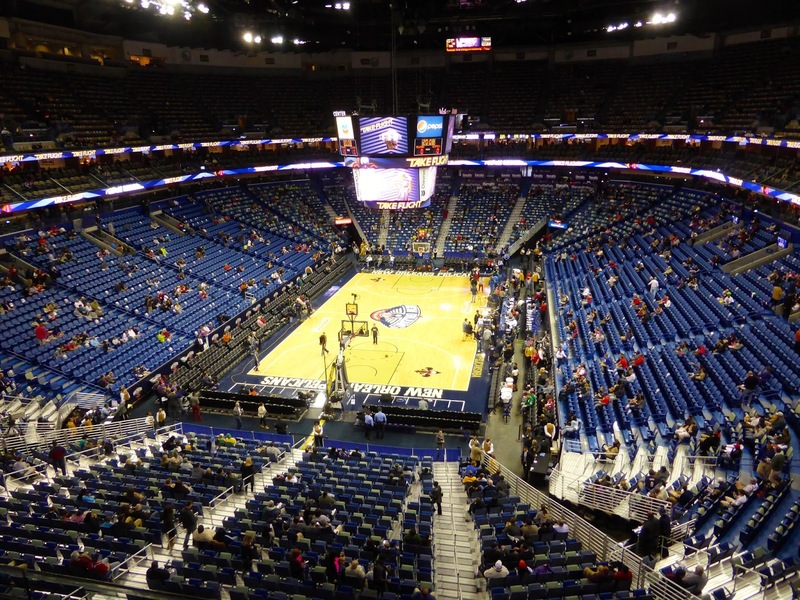 So now the Pelicans play at the Smoothie King Center. Amazingly, nobody even thinks twice about this; fans are so inured to silly stadium names that they are completely ignored. For me, New Orleans was the second last city on my long trip to Club 122. According to some though, it could be considered the last, as I have already seen a basketball game in Orlando, at the old Amway Arena. I prefer to count active venues though, as it keeps one road tripping pretty much continuously, but you can certainly include yourself as a member if you have seen a game in all 122 venues, even those that have been closed. Located right next to the Mercedes Benz Superdome (above), the SKC must feel a bit envious of its more impressive neighbour, whose sponsor is pretty cool too. I'd rather have a $50,000 car than a frozen yogurt, or whatever the hell a smoothie is, even if served by the King. Getting here on transit is easy enough as the arena is just a few blocks from Canal Street, along which one of the trolleys runs. There is an outdoor Pelican Fest with games and cheerleader autograph sessions as well as a live band. This sort of outdoor party is common at NFL games but I've never seen it at an NBA venue. The big advantage is that you pass through security before entering this area, and as many fans come late, there is no waiting or bottleneck. The box office is here as well and the cheapest ticket was $12 for the last row in the upper deck behind the net. The view is actually pretty good from here (below) and you will likely have the whole area to yourself. The highlight here is the food, which one would expect given New Orleans' reputation for the culinary arts. 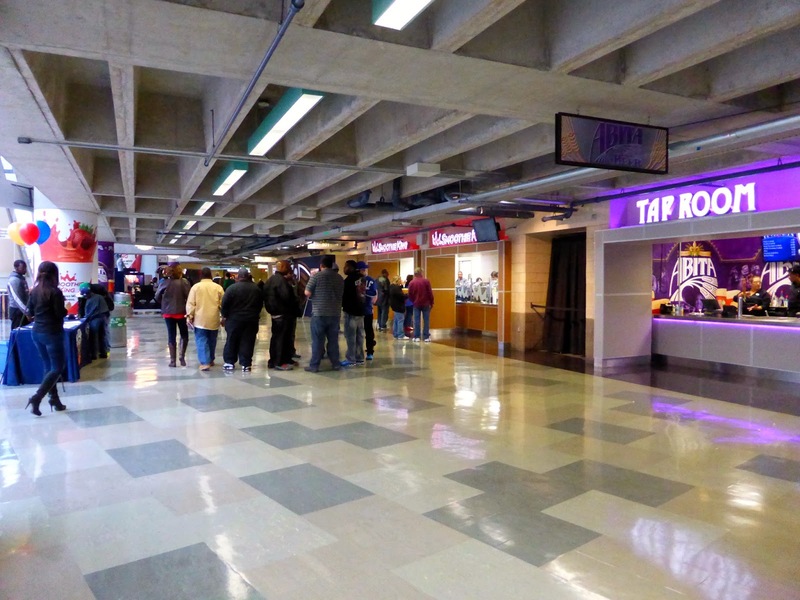 The Pelicans made a concerted effort to improve their concession offerings and it shows, with unique stands throughout the two concourses. My recommendation is the Beefy Mac at Geaux Mac, a mac 'n' cheese combo with plenty of beef, a relative bargain at $8. Popcorn is also on sale for half price during the third quarter. Other options include jambalaya and sushi, but expect to pay $10 or more for those. 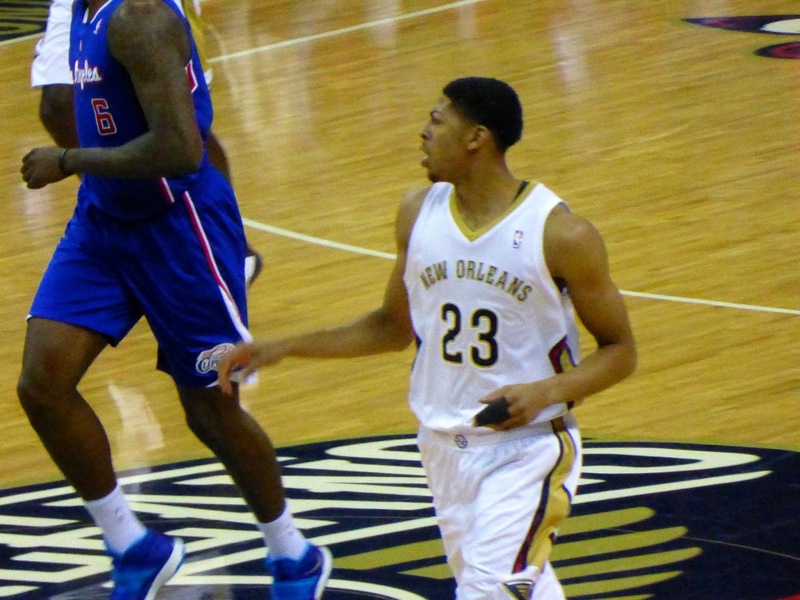 Fans are not that enthusiastic despite having a young, interesting team led by Anthony Davis. At 30-40 coming in, they have a ways to go to challenge in the West, but their 18-17 home record shows they are on the right track for now. 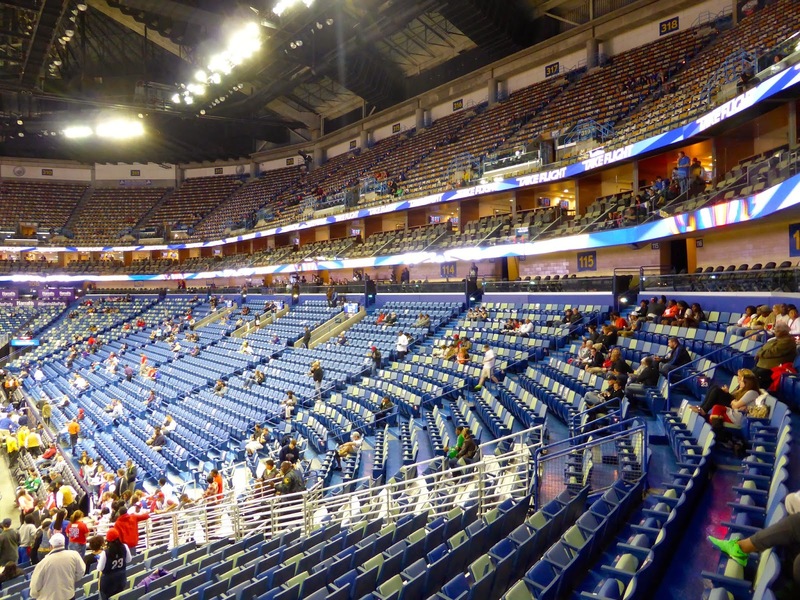 The upper deck was pretty much empty and many of the cheers such as D-Fense and "Let's Go Pels" were routinely ignored. 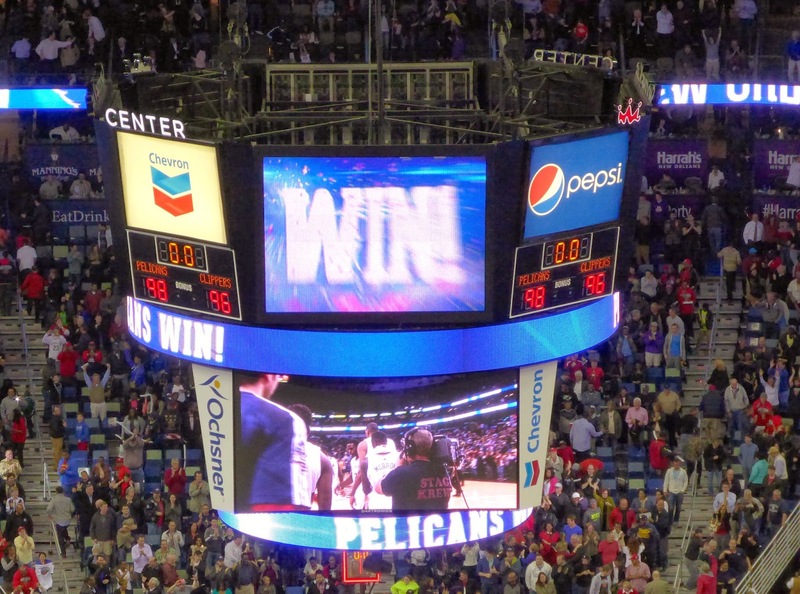 Only by the end of the game did most of the crowd begin to get involved as the Pelicans put on a good show to hold off the Clippers down the stretch. 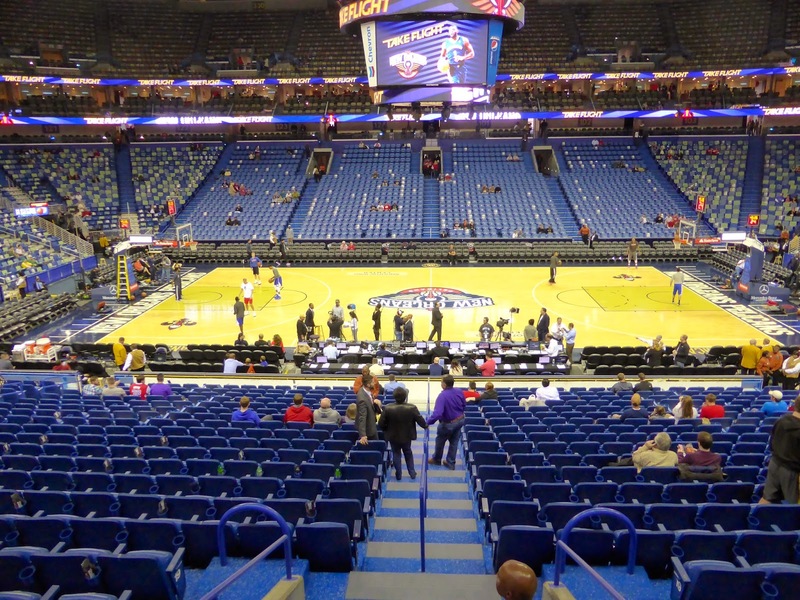 Overall, Smoothie King Center is slightly better than a typical arena, mainly because of the eats. 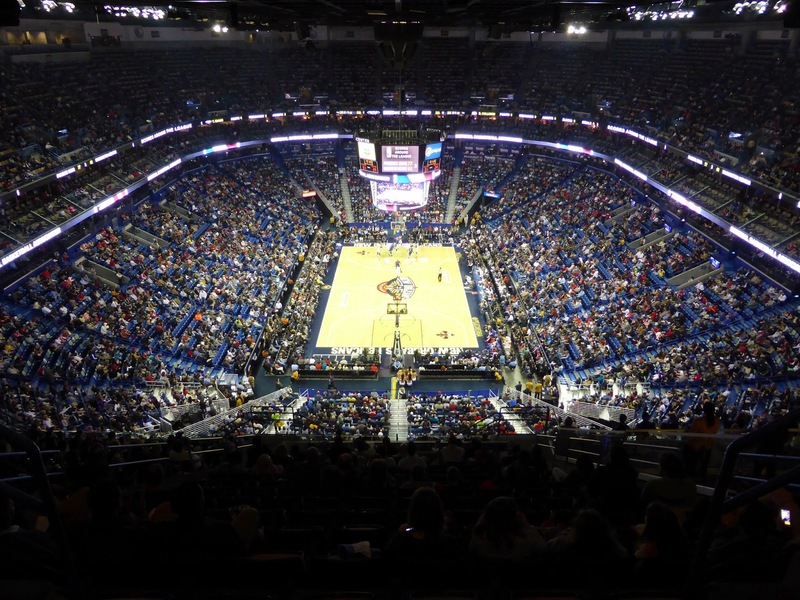 When the Pelicans return to NBA prominence, the fans should again come over in full force and then I think it will become one of the best venues in the league. 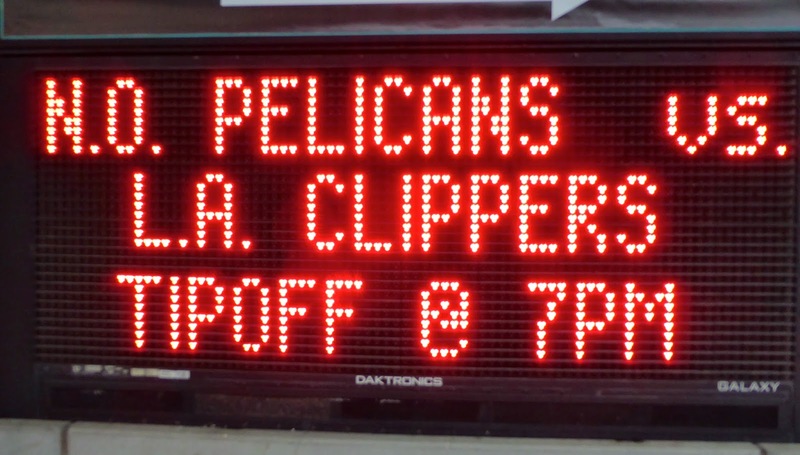 The LA Clippers were in town with former Hornet Chris Paul leading the way. The Clips handily won the three previous meetings but the Pelicans were on a three-game winning streak, including a 10-point victory over the Heat on the weekend. The game started sloppily with turnovers and missed shots dominating, and when Al-Farouq Aminu's missed jumper careened wildly out to Paul (above with the white sleeves), he and Blake Griffin had a 2-on-none break, which Griffin ended with a highlight-reel dunk off a backboard pass from Paul, making it 13-8 LA. The Pelicans were not intimidated though, and even when Davis (above) took his second foul midway through the quarter and had to sit, the rest of the team stepped up to take a 29-27 lead after one. The second quarter saw them extend their lead to 7, but a late run by the Clippers made the halftime tally 55-52 for the home team. After a couple of early free throws by Davis to start the third, L.A. went on an 11-0 run to take a 63-57 lead, but again the Pelicans showed resilience, fighting back to take a 76-75 lead entering the final quarter. An early Pelicans burst highlighted by six points from Alexis Ajinca made it 88-81 and that lead stood up until the last minutes. When Griffin made a running jump shot with 10 seconds left, the Clippers were back within a point, 97-96. 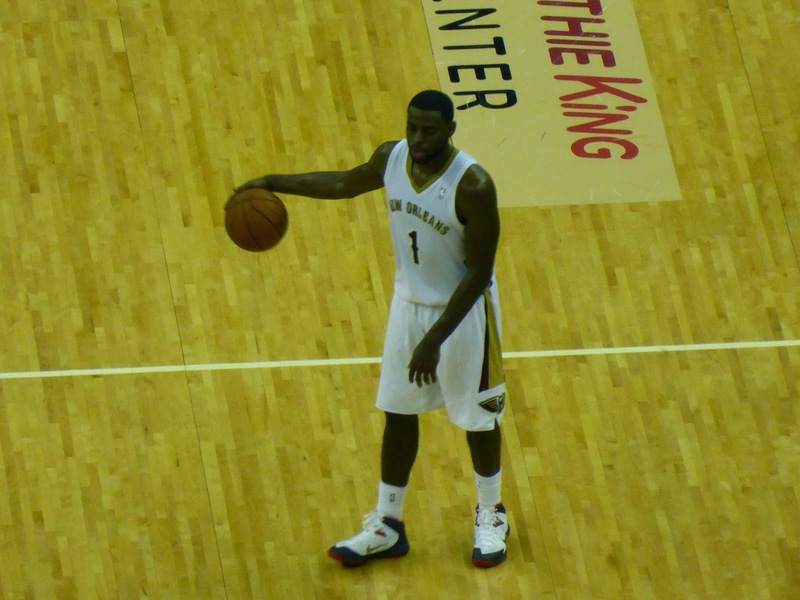 Tyreke Evans (above) fouled Griffin as well, but the free throw was missed, with Davis grabbing the board. He was immediately fouled by Griffin, who walked down the floor hanging his head in shame for his missed freebie (below). Davis only made one of his two, giving the Clippers a chance with 8.8 seconds left. After a timeout, Paul took the ball off the inbounds but couldn't get open. He passed back to Jamal Crawford who launched a last-second three that bounced off the right rim and the Pelicans escaped with the 98-96 win. This was not a bad game with 16 lead changes, but with Miami and Indiana playing each other on the same night, this one was relegated to the back pages. I liked New Orleans style as they didn't rely on the three-point shot (3-12 compared to 13-30 for LA), and their offensive rebounding was the key to their win. 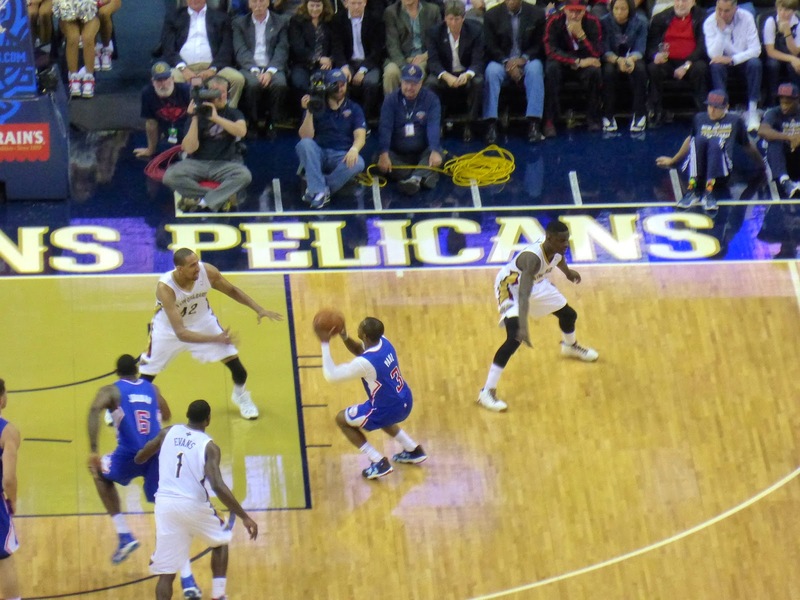 Anthony Morrow led the Pelicans with 27 points while Jamal Crawford had 31 for LA, including 7/15 from beyond the arc. Paul finished 0-12 with just two points, likely the worst game of his career. 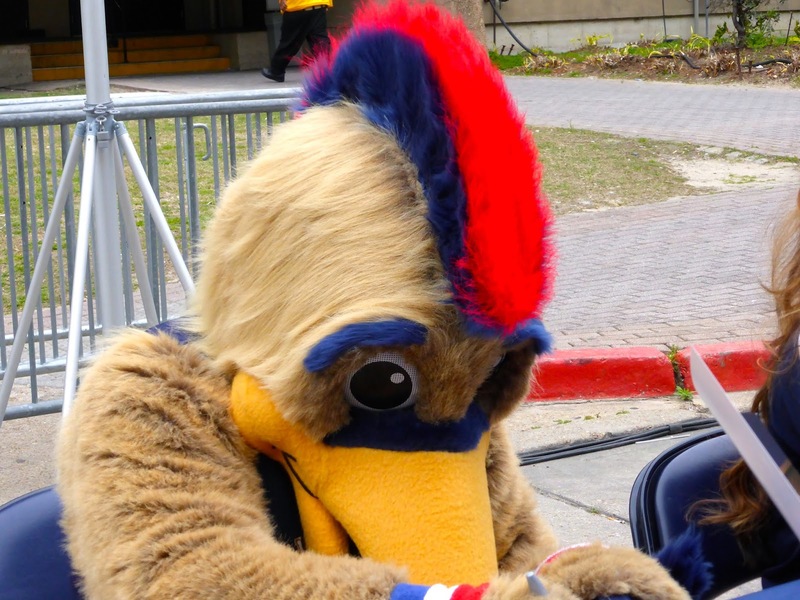 The Pelicans rethought their mascot and the newer version is much friendlier. He even signs autographs before the game. 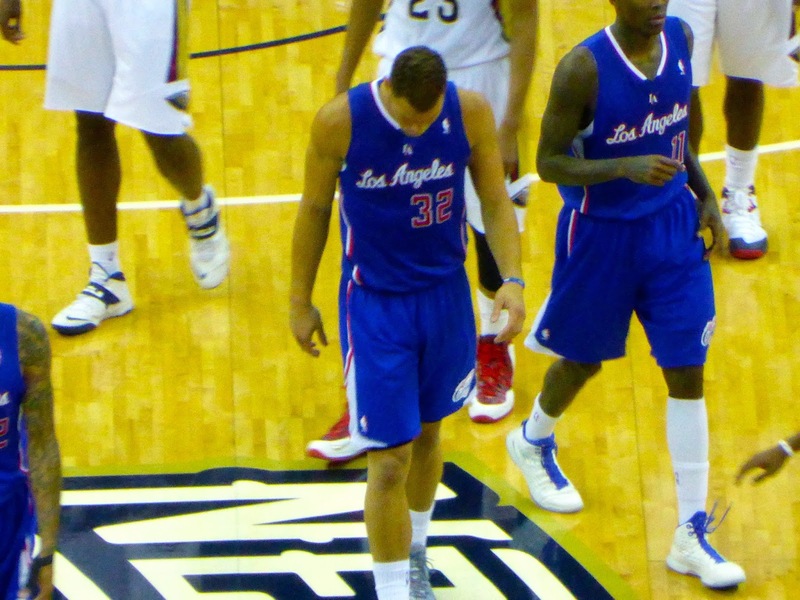 Clippers' coach Doc Rivers' son Austin plays for New Orleans but he had a small respiratory infection and did not dress. Eric Gordon and Brian Roberts were also out with knee injuries, so the Pelicans only dressed nine men. We bought a ticket at the box office and it hasn't been updated to include the arena's new name yet. Smoothie King executives, you are being ripped off! Back to Florida for a three-sport weekend. First up is Florida Gator baseball on Friday Saturday after Friday was rained out, then ECHL hockey on Saturday, then the big game, Raptors at Magic on Sunday. That will be my final venue for Club 122! Check back for updates as usual. I would count this game as completing Club 122, congratulations! Sunday's Magic game would make your membership current as you will have been to all the current venues. Domish, I thank you for your congratulatory message. You are right that having seen a game in all 122 venues should be the true qualifier for Club 122; however, I want my final game to involve a team from Toronto, so I am including active venues to claim my membership.